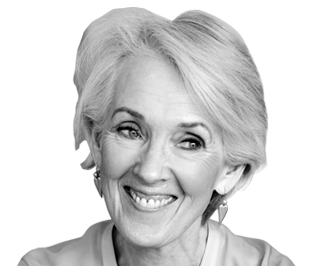 Joanna Trollope has been writing for over thirty years and is well known for her enormously successful contemporary works of fiction. She has been described as one of the most insightful chroniclers and social commenters writing fiction today. Joanna’s first books to be published were a number of historical novels under the name Caroline Harvey. These were followed by Britannia’s Daughters, a historical study of women in the British Empire and more recently, her enormously successful contemporary works of fiction. The Choir was Joanna’s first contemporary novel, followed by A Village Affair and A Passionate Man. The Rector’s Wife, first published in 1991, was Joanna’s first number one bestseller, and made her into a household name. Since then, she has written nineteen more bestselling contemporary novels. Joanna devotes a considerable amount of time to supporting her chosen charities and in particular those associated with literacy. She says: ‘I’m really saddened by the abiding shame that accompanies not being able to read and write properly – and cheered by the real joy that comes with learning to do both. For more information on Joanna’s chosen charities, click here to visit her webpage. When asked to comment on who or what has been the greatest influence on her writing, Joanna’s response was; ‘Simply – just life, I think. At certain stages – I’m sure this is true of everyone – a particular person or book or idea or movie can strike a huge chord, but, looking back, I can see a whole series of influences – personal, educational, social, professional, economic – that have shaped me rather than being able to point to one single colossus and say ‘It was him, or her’. Very few writers who could be said to be prophets, true inventors, What most of us are is interpreters, translators. We take the old human truths that Shakespeare and Sophocles described inimitably, and we re-interpret them for our own times, in our own voices, coloured by as it were, our own messages to the world. Joanna’s family is hugely important to her. She is the eldest of three, the mother of two daughters, stepmother of two stepsons, and, now, is immensely enjoying being a grandmother. Joanna once saw a car sticker in the States. It read: “If I’d known how wonderful grandchildren were going to be, I’d have had them first”. She has been married twice and now lives on her own in London. Joanna still has the same core group of close friends she’s had for the past thirty years, and many more friends in the world of writing.